Highly capable, traditional-style small-body all-rounder, offering exceptional value for money. Quite astonishing sound, playability and build, given the excellent price point. A slightly wider neck would aid the fingerpickers out there. Have you noticed that acoustic guitars are everywhere at the moment? Rock might not be as dead as the trendmakers were proclaiming, but there's still no denying the increasing folk and Americana influences in the charts, both in the UK and across the Atlantic. All of which makes Yamaha's revamped-for-2014 L Series, including this small-body LS16M, potentially well timed. The brand might not be the most obvious choice for the new folk hopefuls, but with veritable legends James Taylor, Paul Simon and Bruce Springsteen among its artist roster over the years, you can't deny Yamaha's form. To whit, the new Chinese-built 16 L Series guitars represent an auspicious meeting of the brand's ultra-credible heritage with distinctly mid-level pricing. All the new 16 Series guitars get a solid Engelmann spruce top, treated with Yamaha's ARE process. The company goes into plenty of detail in its marketing materials about ARE, claiming that by manipulating temperature, humidity and pressure at a 'sub-cellular' level, the spruce's molecular structure is changed to be closer to what it would be after many years of playing and use: it's 'played in', 'older', or however you want to term it. There are solid mahogany (as on our model) or rosewood back and sides available, but there's no mahogany-topped option, which is a slight surprise given the recent popularity of such instruments. The amount of urethane finish build-up where neck meets body doesn't look great, but it's not an indicator of a too-thick finish; you can just about perceive some of the spruce's grain undulations beneath the gloss, which is just how we like it. "We like this neck; it has enough meat to feel traditional and a good compromise of string spacing choices"
The good news is that the L Series neck is now a five-piece mahogany and rosewood laminate (instead of three), offering increased strength and rigidity, and enabling more efficient use of timber to boot. It also means that the neck will contribute to the guitar's overall resonance in a different way than it would were it constructed from a single piece of mahogany. It's a proper, glued mortise and tenon joint, for the record. We like this neck; it has enough meat to feel traditional and a good compromise of string spacing choices to suit strumming and picking. But we can't help wondering if Yamaha would have been better off increasing the nut width and string spacing for the fingerpicking style in which it's most likely to be played. While there is a pickup, the only visible clue is the endpin jack socket: no preamp, no battery, no controls, nothing. It's a brave move for Yamaha to eliminate all onboard control and suggest that users need either a DI or outboard preamp to get the best from the guitar: lest we forget, we're constantly moaning about over-complicated, ugly preamps in acoustics, not to mention how compromised most of them sound. 'Keep it simple' seems to be Yamaha's new approach, and we're never going to argue with that. As ever with Yamaha, the standard of finishing is superb, almost to the point where we forget to comment on it. "With its smaller body, the LS has a focused and prominent midrange voice"
With its smaller body, the LS has a focused and prominent midrange voice, also with slightly less overall volume than the larger, more bass-and treble-rich models in the range. The stiffness in the five-ply neck contributes to the guitar's generally bright, lively tones. 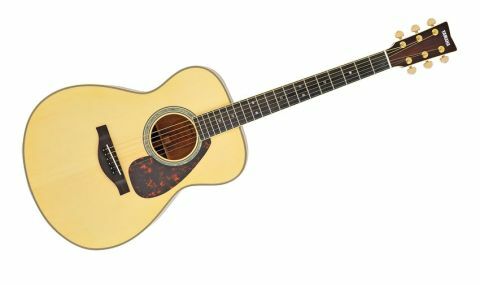 It's not a notably powerful or deep bass, and the overall tonal picture is very different from the lower midrange warmth of Martin's 15 Series, for example, perhaps the modern benchmark in current 'new folk' instruments. That said, there's no denying the L Series family trait of impressive balance and poise. It's never going to wow you, Collings-style, with its piano-like projection and clarity, but it's nevertheless a sound that sits very well both live and when recorded. Plugged in, the 'Zero Impact' passive pickup is instantly likeable. With our reference AER Compact 60 3 set with flat EQ in channel one (high-input sensitivity selected, 'colour' deactivated), there's plenty of output from the passive system that returns a very balanced all-round tone. There are no obvious feedback issues, minimal quacky piezo mids and no razor-sharp highs. The only downside is that you have no onboard control whatsoever; but a sound engineer will be more than happy with that situation. The current popularity of 'new folk' music will do no harm at all to Yamaha's upgraded 16 L Series guitars, even though the company hasn't hitched a ride on the all-mahogany bandwagon. More important is the timeless approach that makes these guitars just as relevant in 2014 as they would have been at almost any point in the 40 years since the L Series first appeared. The temptation is to compare the 16 with £1,000+ guitars, because that's the level of spec and detail you're getting, but of course the price is way lower than that. Simple, high quality and good sounding - it's extremely impressive.